Too often, a video project gets delivered, and then it’s then tucked away on a legacy MAM (Media Asset Management) system — where it’s seldom seen again. Essentially the equivalent of a dusty filing cabinet, this approach to content management makes it difficult to find, share, and reference past work. 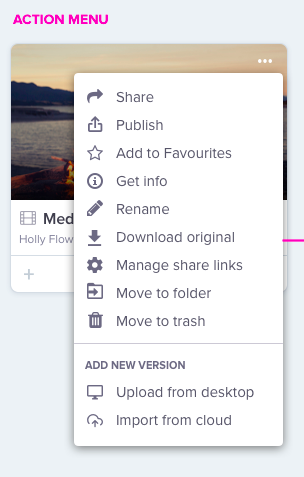 Today, we’re excited to announce some updates that make it even easier to collaborate on dynamic, ever-changing content. We’ve created a virtual workspace where you can not only store, find, and reference content, but also where you can share, review, and collaborate on them at any moment from the first edit to final publish and beyond— no matter where you are. Ready to dump that one-trick-pony filing cabinet? Here are the new updates you should know about. How long did it take you to find and download “Final1_FINAL_actualFINALthistime003.mov” on your internal servers and hard drives? When you’re on a deadline, unexpected delays can make or break a campaign. Now your Wipster library is bright, uncluttered, and color-coded to project stages which makes finding your video content effortless and keeps every version of your video stacked and tightly organized in the cloud. You can also use our dark mode/light mode selector to rest tired eyes after late nights at the office. A search function as quick and ready for the challenge as you are. All your content right at your fingertips, simply search by type, field or status, grab your desired file, and get back to work. Every video has its place, and you just found what you were looking for in record time. Where are your projects getting bottlenecked? How many are “in-review” or “awaiting approval”? Now all of your videos are color-coded with Project Status tags, easily viewed from folder level, so you can quickly see the status of each piece of content, individually manage their progression, and keep them on schedule. Behind every video file is a lot of collaboration. Wipster brings valuable information front and center with our project activity sidebar. This gives you a quick play-by-play on what’s happened since you went out for lunch so you can get right back into the next round of edits. Also, on every file, we surface contextually relevant activity, comments, uploads, and more based on the stage of your project (in review, approved, etc.). Quickly move content along in your workflow with a full menu of actions available from the library view. Share links, download videos, or publish to one of our integrations with Youtube, Facebook, Twitter, Wistia, or Brightcove, all with a quick click right from the project. Collaborate in one digital workspace accessible from anywhere. Quickly search and find images, videos and other content by keyword, file type, status and more. Easily keep track of the status of your content (who’s commented, how it’s performing, if it’s been published, and more). Ditch your filing cabinet and sign up to Wipster today.